Acting with head and heart. This is the message from British Prime Minister David Cameron. 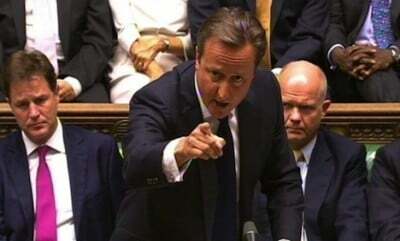 Britain, he claimed last week, has a “moral responsibility” to help the Syrian refugees. If that was the case, it was certainly a newly found one. Till recently, the good will to aid other European states beset by the human train was rather short. Germany alone received 11,000 asylum seekers on Saturday with roughly the same number arriving on Sunday. Of course, Cameron is arguing that Britain did far more for Syrian refugees than other powers closer to the ground of conflict. Efforts are being made closer to the source. Funding has been provided for refugee camps along Syria’s border at points in Turkey, Lebanon and Jordan. According to the BBC, this has also involved funding for running water, food, medicine and shelter. The Chancellor of the Exchequer George Osborne is tight lipped about actual numbers. Would there, for instance, be an expansion of the Syrian Vulnerable Persons Relocation (VPR) scheme? (To date, numbers arriving in the UK have tended to be paltry relative to other states – since March 2014, a mere 216 Syrians have arrived on the scheme.) On the Andrew Marr show, he proved cagey. Osborne did, however, admit that the money would be coming from the foreign aid budget, which could “provide the support in the first year for these refugees, [and] can help local councils with things like housing costs.” This touted “rethink” may encounter resistance from the Treasury clerks concerned that the money should be kept for its foreign projects. Redirecting some of the funds to local, domestic projects will certainly surprise some. Hearts are gradually thawing. Charities have cited growing interest in Britain’s response to the crisis. British citizens and residents are also getting busy in the activist stakes, with a petition calling on Britain to increase its refugee intake receiving some 420,000 signatures. Even the Scottish government has come on board, pledging 1m pounds. While condemning the people smugglers and expressing concerns about increased numbers of asylum seekers, he has been entertaining, at stages, open military action against Syria. Along with Chancellor Osborne, this constitutes targeting the problem at the “source” – which is mild code for eliminating the Assad regime and Islamic State. Resettlement tends to be subordinate to this end. In Osborne’s words, “You need a comprehensive plan for a more stable, peaceful Syria – a huge challenge of course, but we can’t just let that crisis fester. We have got to get engaged in that.” There has never been anything of the sort. When the issues of targeting Assad regime went to a Commons vote in August 2013, the motion for such action failed to pass by 285-272. When a similar motion was put to the test in September 2014 regarding the targeting of Islamic State targets in Iraq, it did pass. Former president of the European commission, Romano Prodi, has been deeply unimpressed by Cameron’s general stance on accepting refugees. He puts it starkly: Britain has not been pulling its weight, certainly not if you consider the call by the German chancellor, Angela Merkel, to do so on the basis of population, GDP and jobless rates. Cameron’s recent budging on the issue, if only to the point of conceding that “thousands” should be accepted, suggests a good deal of politicking rather than a genuine admission of responsibility. He seemed to be channelling Prodi – but only to a point. There is another point that has tipped the issue in favour of the refugee cause. The issue is starting to become very bad publicity, and the public relations crews are on to it. Fittingly, Cameron was, in his earlier life, a public relations conjurer. The death of Aylan Kurdi received wall-to-wall coverage, even in the more reactionary press. The general sense is that Cameron has to be seen to be doing something, however vaguely. Drowning, it seems, leads to profound gestures of sympathy and horror. But it doesn’t necessarily change policy.